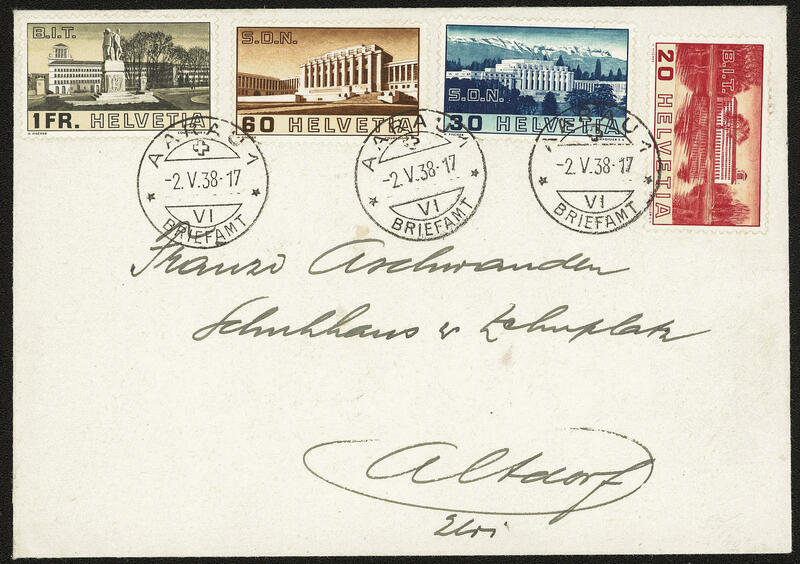 4171 ⊙ 293a 40 C. On 90 C. Airmail 1926, the good orange red overprint, fresh colors and very well perforated, neat cancelled \"WENSLINGEN\", photo expertize \"genuine and immaculate\" Eichele. SBK 1250,- Sfr. 4172 301yI/II 20 C. Gotthard train, smooth gum, both types, in perfect condition mint never hinged Michel 265,- €. 4173 ⊙ 313yAbart 30 Rp. 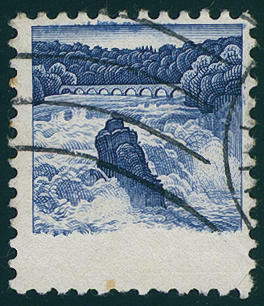 Rhine Falls 1936, smooth gum, with spectacular variety \"numeral of value and denomination of the country missing\" through at the bottom stayed away blue printing, clean legitimately cancelled an impressive and very scarce happenstance variety. Photo expertize Eichele. 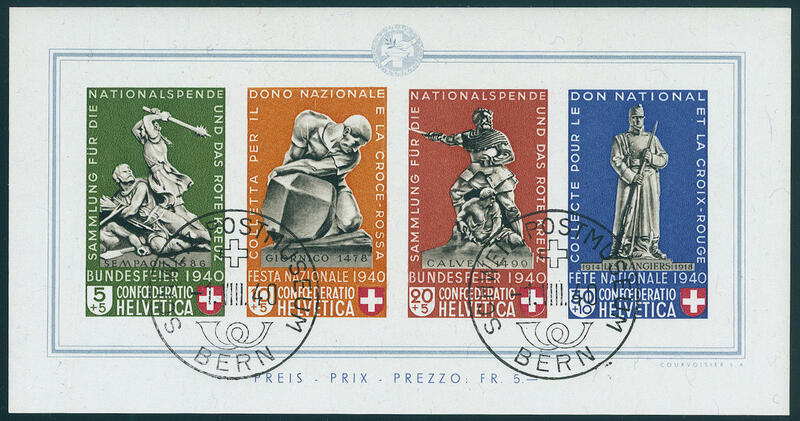 4174 FDC 321/24 Labour organization and League of Nations 1938, in perfect condition on First Day Cover from \"Aarau 2. V. 38. \" to Altdorf. Rare! 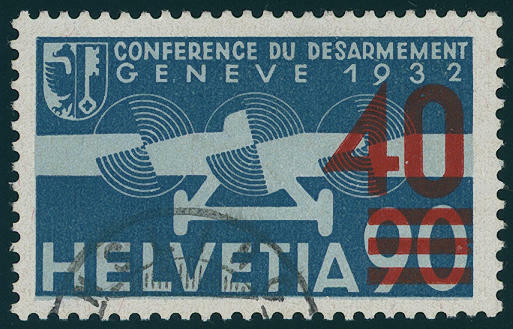 4175 325 75 on 50 C. Pro aero 1938, fresh colors and in perfect condition mint never hinged these airmail stamp was actual only in used condition issued. 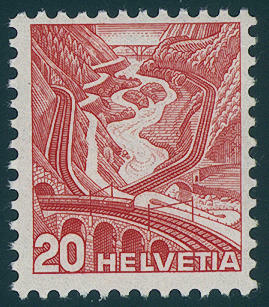 In mint never hinged condition are only a few examples have been preserved. Photo expertize \"mint never hinged in excellent condition\" Rellstab BPP. 4176 ✉ 327 20 C. Landscapes on an extraordinary Catastrophes letter from \"OBERRIED BRIENZ 23. IX. 41. 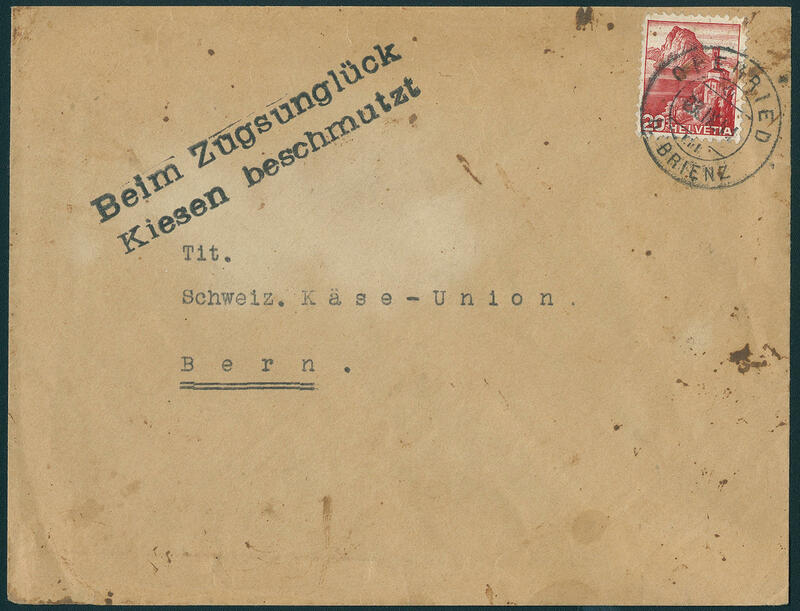 \" with additional clear scarce two line cancel \"near the railway accident to gravel dirtied\" to Bern. There are only a few letters from this known! 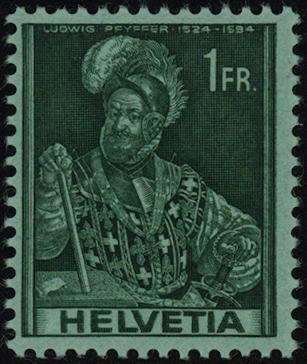 4177 Bl.5 Pro Patria-block 1940, in perfect condition mint never hinged Michel 400,- €. 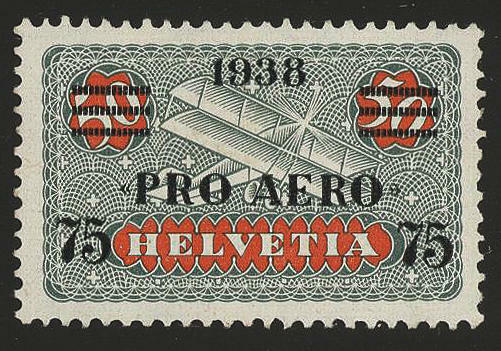 4178 Bl.5 Pro Patria-block 1940, in perfect condition mint never hinged Michel 400,- €. 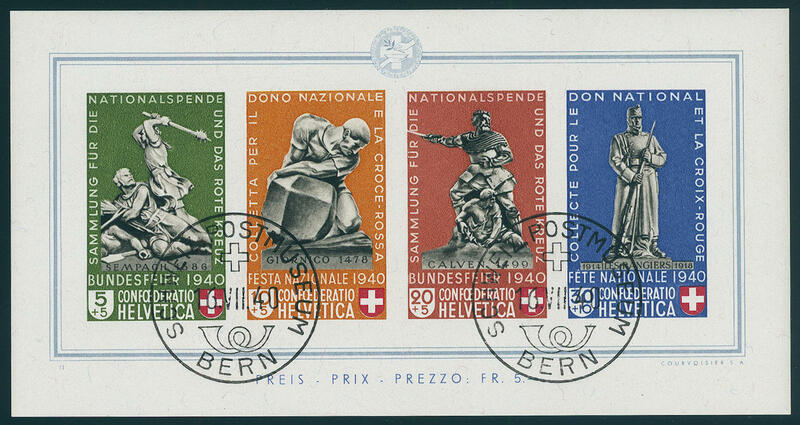 4179 ⊙ Bl.5 Federal celebration souvenir sheet 1940 with perfect first day cancel \"BERN Switzerland. Postal Museum 16. VII. 40\" in utterly perfect condition. Photo expertize \"genuine and faultless\" Marchand. 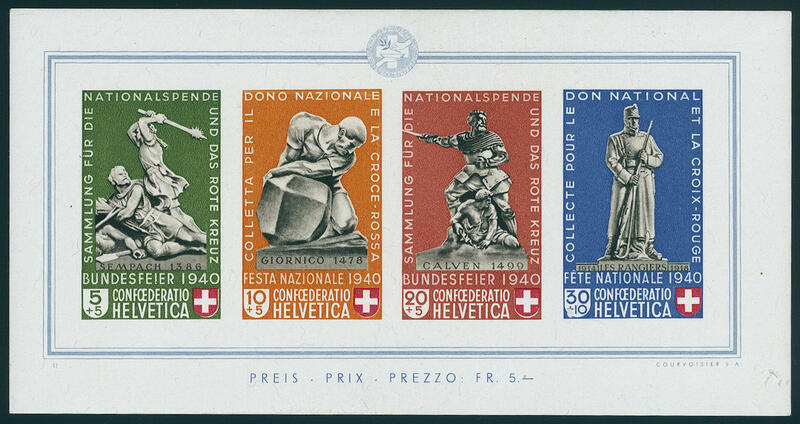 4180 ⊙ Bl.5 Federal celebration souvenir sheet 1940, fresh colors and in full original size, with complete gum, perfect used \"BERN Switzerland. Postal Museum 1. VIII. 40. \". 4181 373I 5 Rp. 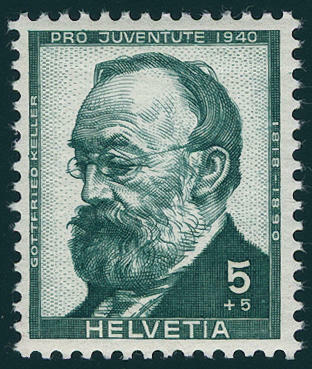 Pro Juventute 1940, the very scarce not issued stamp with faked year of birth \"1818 in lieu of 1819\", fresh colors and in perfect condition mint never hinged, without any signs. There are only few examples into the trade arrives. Photo expertize \"genuine and immaculate\" Eichele. SBK 4500,- Sfr. 4182 382DP 1 Fr. Colonel Pfyffer with double embossing, wonderful fresh colors and very well perforated, in perfect condition mint never hinged, scarce variety, expertized Rellstab, photo expertize Eichele. Michel 900,- €. 4183 384Abart 1, 50 Rp. Historic pictures 1941, vertical pair from lower margin with spectacular variety \"glued paper web\", fresh colors and very well perforated, in perfect condition mint never hinged there are only few examples from this known! (Zumstein no. 250.1.08. ). Photo expertize Eichele. 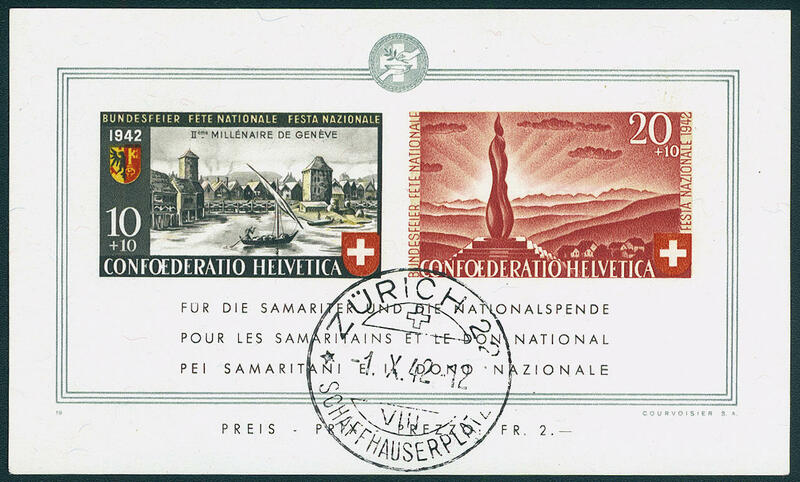 4184 GeF.Heft 398 750 years city Bern 1941, gift booklet with the unperforated stamp in the unused block of four (lower pair mint never hinged), as well an used perforated block of four. 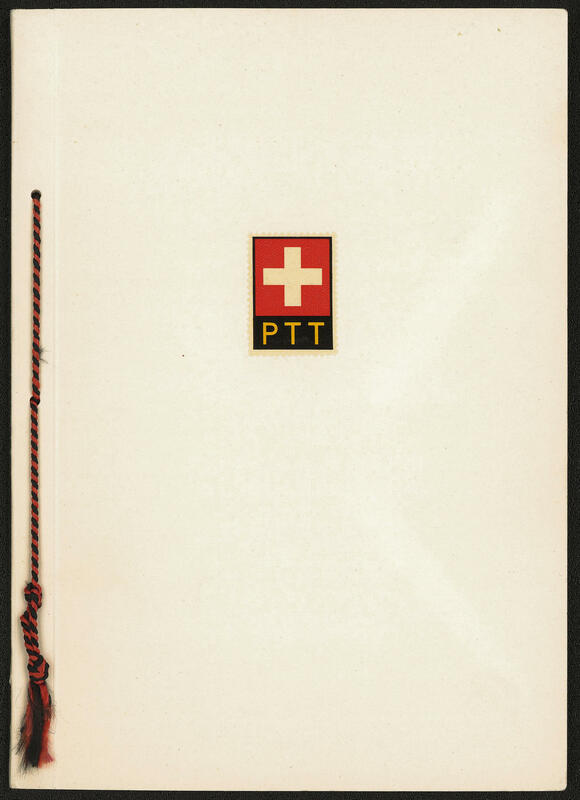 Complete booklets hereof become rare offered! Michel 950,- €. 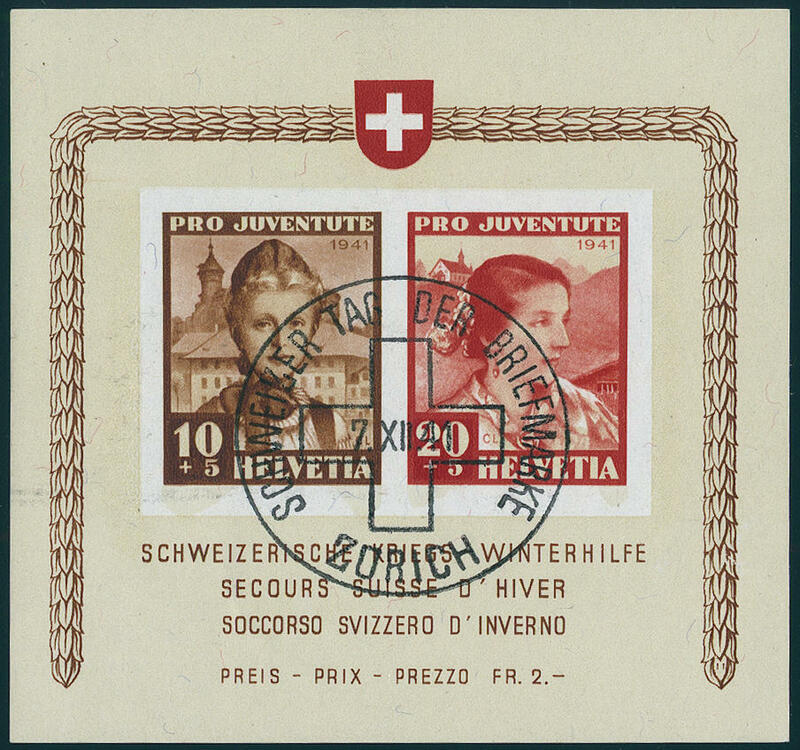 4185 ⊙ Bl.6 Pro Juventute souvenir sheet 1941, in perfect condition with special cancellation \"Zurich Swiss Day of the Postage Stamp 7. XII. 41\". With full original gum. 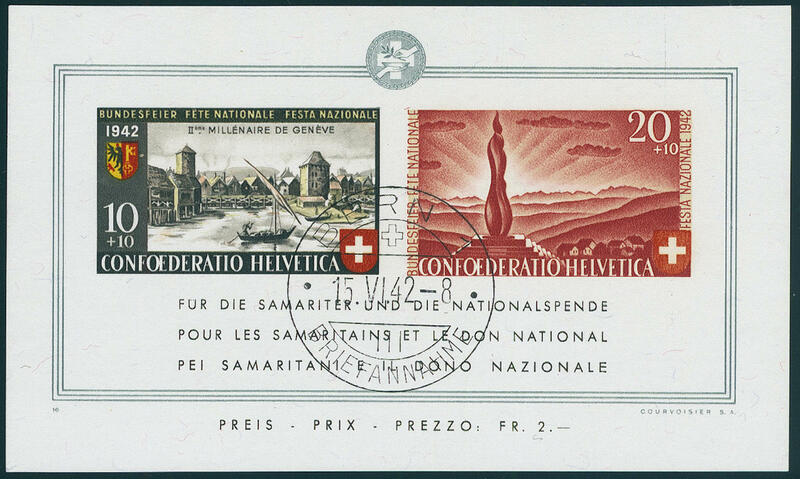 4186 ⊙ Bl.7 Federal celebration souvenir sheet 1942 with clear first day cancel \"BERN 15. VI. 42. \" in perfect condition. Photo expertize Rellstab. 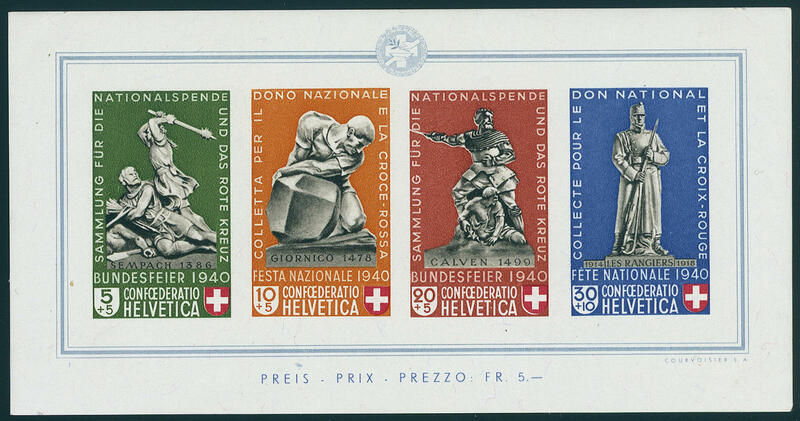 4187 ⊙ Bl.7 Federal celebration souvenir sheet 1942, neat cancelled \"Zurich 1. X. 42. \", photo expertize \"genuine and immaculate\" Eichele. Michel 300,- €. 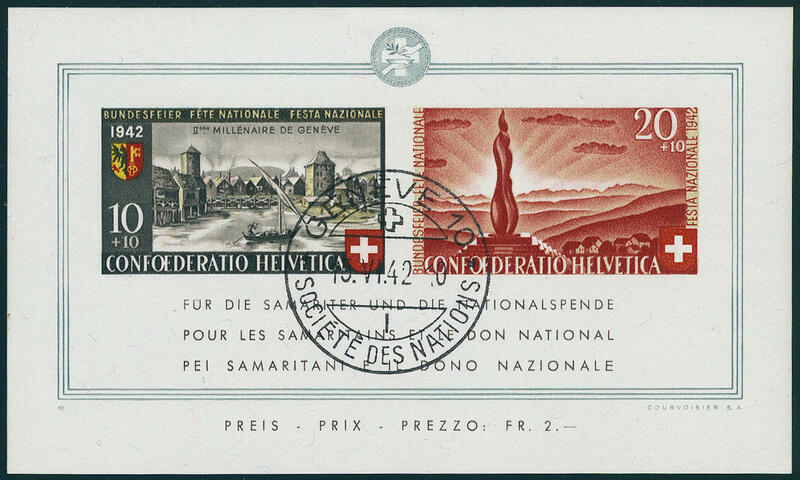 4188 ⊙ Bl.7 Federal celebration souvenir sheet 1942, fresh colors and in perfect condition, neat cancelled \"GENEVE 15. VI. 42. \" from first day. 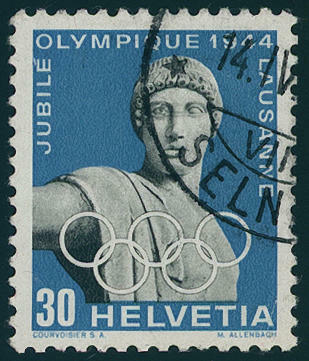 4189 ⊙ 430xI 30 C. Olympic Committee 1944 with scarce plate flaw \"apollo with open eye\", fresh colors and neat cancelled, photo expertize \"genuine and immaculate\" Eichele. SBK 2400,- Sfr. 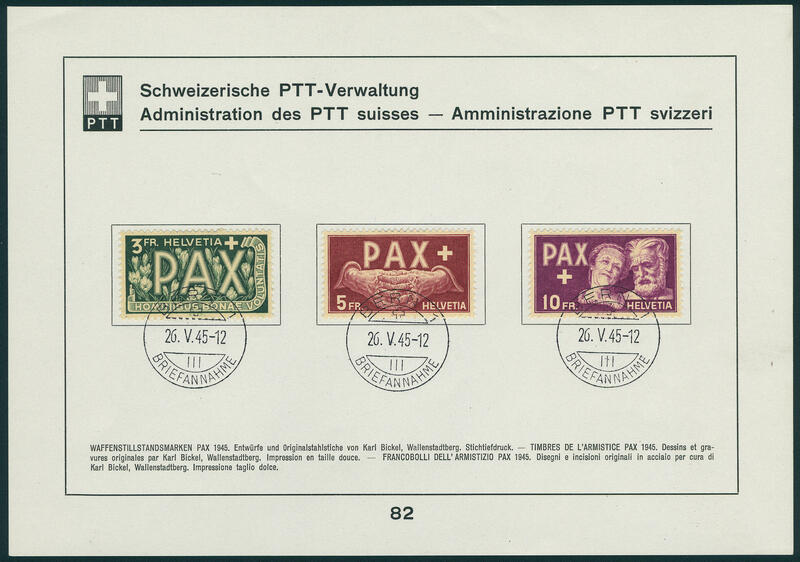 4190 ✉ 447/59 PAX set 1945, all 13 values on three very nice PTT pages, perfect used \"BERN acceptance letter 26. V. 45. \". A wonderful set for the highest standards!